American Literature (though the true definition is disputed as to what American Literature is, let’s pretend we all agree right now) can be found sprinkled among many of today’s movies and TV shows. As more about American History is discovered and screen production gets better, the possibilities of the development of American Literature in media expands. The theme of racial injustice is still prominent among these forms of media. A movie that is a good example of this is Avatar. This is screenplay brings out the modern version of racial injustice while talking American Literature into the now. Avatar is a movie directed and written by James Cameron that premiered in 2009 (Trailer linked at the bottom). It follows the protagonist Jake Sulley, a Marine who has lost the use of his legs. The movie takes place in the distant future but it is not exactly stated when. Jake finds out his brother, who was a scientist, has been killed and is offered by the RDA (Resources Development Administration) to take his place in the Avatar Program. They offer him the job because Jake and his brother are identical and can, therefore, use the Avatar that was designed for his brother. Jake is launched into space where he arrives, “five years, nine months and twenty-days” (Space Doctor 1) later on Pandora, a habitable moon orbiting a distant planet light years away. Humans can’t breathe the air but the planet is rich in life, animals, various elements, and an indigenous people called the Na’vi. Through the Avatar program, Jake can link with a body that looks like the Na’vi that can survive in the outside world. To essentially sum up the rest of the story, Jake meets a native woman (who just happens to the chief’s daughter) who changes his whole outlook on the planet and nature and he chooses to abandon his forest cutting- indigenous killing counterparts to stay with her and save the day. It’s basically Pocahontas in space. I mean we all saw the Disney movie. However, this is what makes it interesting. The story is familiar and has its roots in Native American racial injustice narratives but takes place on a distant planet far far away. This story is actually pretty close to the beginning of The Female American. Though she is not the main character, Neytiri (Ney-tier-e), the love interest, is a strong woman who’s native to the land but can also speak English. In fact, her and Jake’s love story is very similar to Unca Eliza’s mother and father’s. Jake, like Unca’s father, is captured by the natives and brought back to their home. They are then both asked about religion as religion is important is both Avatar and The Female American. “Men, for I see you have legs, arms, and heads as we have, look to the sun,’ here he pointed up to the luminary, “He is our God, is he yours?” (Winkfield 48). They are both saved from being killed by a sign of deliverance. Jake is saved by a sign of Eywa, the Na’vi’s goddess, and Unca’s father by the chief’s daughter who “stroked [my] father with a wand” (Winkfield 49). They are both then put in the care of the daughters of the leaders of the natives in each story. Each begins to fall in love with their counterpart and set out to “marry” their native women. However, as in the case of both stories, jealousy tries to sabotage this plan. In The Female American, the elder sister of Unca’s mother falls in love with her father. She professes her love but he turns her down in return she says, “If you will not love me, you shall die; my sister shall never enjoy an happiness that I aspire to; nor shall my vengeance be long delayed; this instant shall put a period to your life” (Winkfield 52). In Avatar a native man named Tsu’tey (Sue-tay), who is promised to Neytiri, is jealous of Jake and after finding out that she mated with him (oh scandalous) he attacks Jake and tried to kill him. Both jealous parties end up regretting their decision in the end and befriending and respecting Jake and Unca’s father. 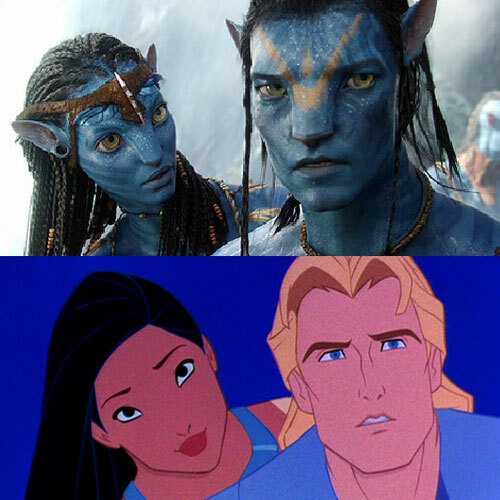 The story of Avatar also brings in themes of colonization. White men, presumably American, invade an already inhabited place and start calling their own; killing off any natives who oppose the taking of their home. Both the Na’vi and Native Americas are far more connected to nature than their white counterparts. In Avatar, the humans need technology to live on the planet. Overall, the whole thing echoes America’s colonization and war with the Native Americans. Avatar is proof American Literature now has adapted to new tastes and media while still maintaining its beginnings. Avatar shows that while it takes place on a new planet there is nothing really new about the story. Overall, it returns to the racial injustice narrative. This shows that these issues are still relevant and needed to be addressed through various medias. While we may not be able to travel to space, it doesn’t mean James Cameron wasn’t trying to say something. Whether he was making a statement about history repeating itself or atoning for America’s past sins, I’m not sure. But on this is clear, he knows what he was referencing. Next: SHOOK: Django is Madison Washington.. with a trigger happy finger.